Hot Granny Sauce is one of my favorite toppings. 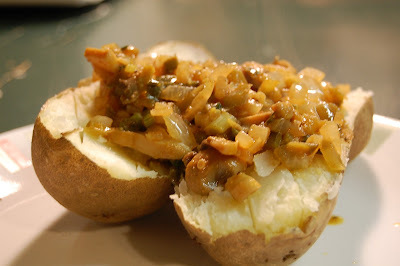 I love it on baked potatoes but if you enjoy spicy hot flavors and mushrooms, it would go well with anything. I originally found this sauce in Paul Prudhomme's Louisiana Tastes cookbook in a recipe for Slow Seared Rib Eye with Hot Granny Sauce. It was delicious with rib eye but through the years, it's become a go-to sauce for our family. Sauteed mushrooms, onions, jalapeno peppers and scallions combined with a handful of Cajun spices. It only takes a few minutes to throw together but add a big punch of flavor to any meal. 1. Combine the seasoning mix ingredients in a small bowl. 2. Make the sauce: Melt the butter in a 12-inch nonstick skillet over high heat. As soon as the butter melts and begins to sizzle, add the onions, jalapenos and 2 teaspoons of the seasoning mix. Stir well and cook, stirring frequently, until the onions are slightly translucent, about 6-8 minutes. Add the mushrooms and green onions and stir well, then add the Worchestershire and the stock. Bring to a full boil, stirring constantly, and cook 1 minute. This looks fantastic! I love mushrooms and spicy, and I don't have a recipe that combines the two, until now. Thanks!